August 15, 2018 — Comments are off for this post. I’m very pleased to today reveal the new look for Cowly Owl and a new focus: games for the whole family to play together. I founded Cowly Owl in 2012 (read the origin story). After 5 apps, multiple platforms and content updates, I felt like I had lost my sense of direction. It was time for me to refocus and decide what was important to me going forwards. Having spent many years creating interactive installations that encouraged playfulness between people in the same physical space, I felt there was something missing in the apps I was creating. 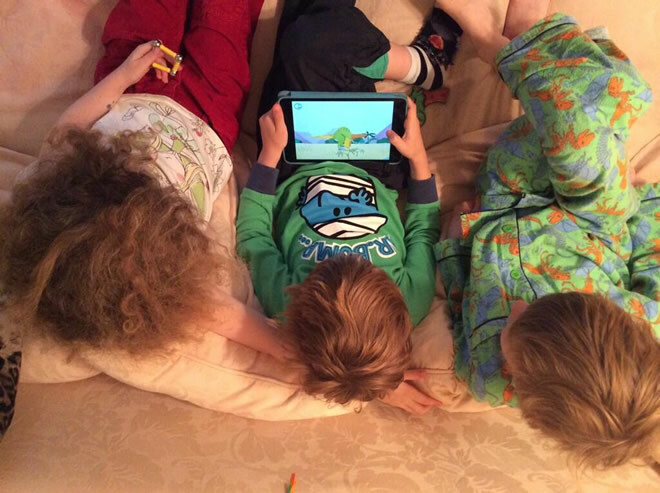 Whilst you could sit next to your child when they were playing with my apps, they were designed as single player experiences, so often it would be difficult to join in. Recently my own children have reached the video game playing age. I have been rediscovering the fun from my childhood, of playing and exploring these worlds together. 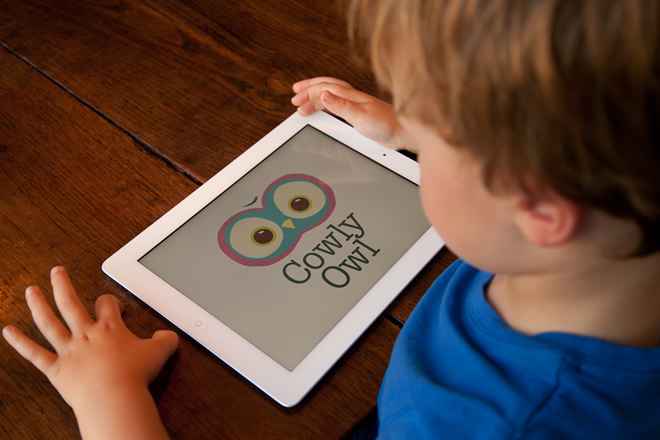 Today I am relaunching Cowly Owl, on mission to bring families together through the joy of games. Read more here. From now on, all games I make will be designed with multiple players in mind, aiming to encourage social interaction, creativity and exploration together. The logo was created by Rex Crowle (Media Molecule/Tearaway/Knight and Bikes). Although we finished the logo over a year ago, I’ve been busy trying to finish the new game before revealing this. The animated ident was made by long time collaborator Wip Vernooij, with audio design by Resonate. Over the next few weeks I will be updating existing apps with this new branding. Today however brings another surprise, a new game launch! Introducing Sizzle & Stew, a cooking game for two players. Available right now on the App Store. October 13, 2017 — Comments are off for this post. Rebuilt from ground up, every part of the code is new, along with much improved animated numbers that respond to your touch. 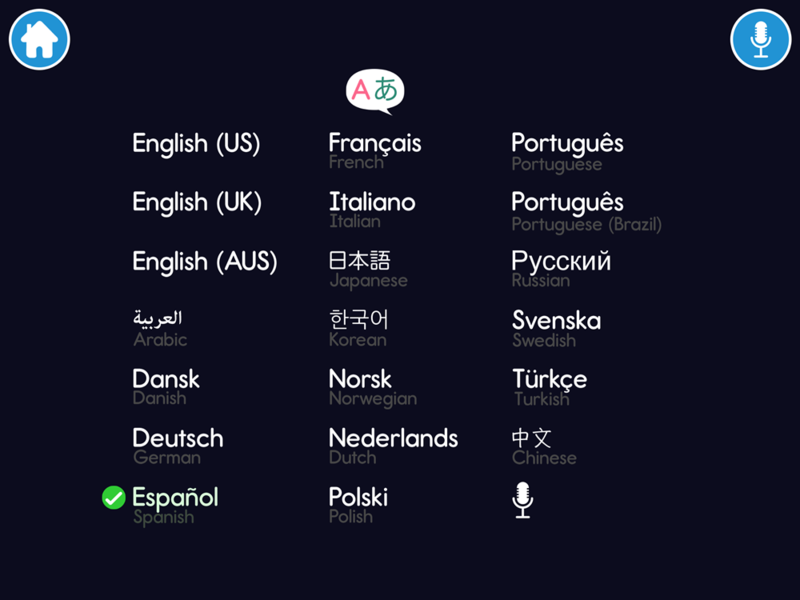 For the first time ever, many languages available to choose from. The app is discounted by 50% if you purchase it from Apple via the Volume Purchase Programme for Education (20 copies or more). July 19, 2017 — Comments are off for this post. My goal for Cowly Owl has always been about having the freedom to create what I love whilst providing a sustainable income for my family. 2017 is the first year I have completely excluded client work in order to concentrate solely on Cowly Owl as a business, the fruits of which you will get to see in the coming Autumn. Although I may not have hit the dream balance yet, I still want to be able to use my company to help with good causes, either through funding special projects or donating my time and expertise where I can. This year I decided to sponsor the construction of a growing garden for children at Trull Church of England VA Primary School, as well as equip it with tools and seed stock. School vegetable gardens are a fantastic environment for children to learn firsthand where food originates from, to understand seasonal growing cycles, in wonderful sensory outdoor classrooms, surrounded by an abundance of scents and flavours to discover. Find out more about why growing vegetables in schools is important at the RHS Campaign for School Gardening. The garden has been in planning for a while and back in April, work finally sprang into action. Parents, teachers, local tradesmen and students alike, came together to volunteer their time in order to help make the new outdoor education space a reality (we, of course, pitched in with the hard graft too). In addition to around two hundred hedging saplings being planted, four raised beds were built, a long picket fence constructed (all made from scratch, by hand!) and woodchip spread onto all the pathways. January 6, 2017 — Comments are off for this post. Back in 2012 I had an idea, what if a toy car was a screen with sensors and a speaker? You could change the surface of the car to be any vehicle, with motion activated sounds. Before I had even started Cowly Owl, I created this first app as an experiment on the iPhone. 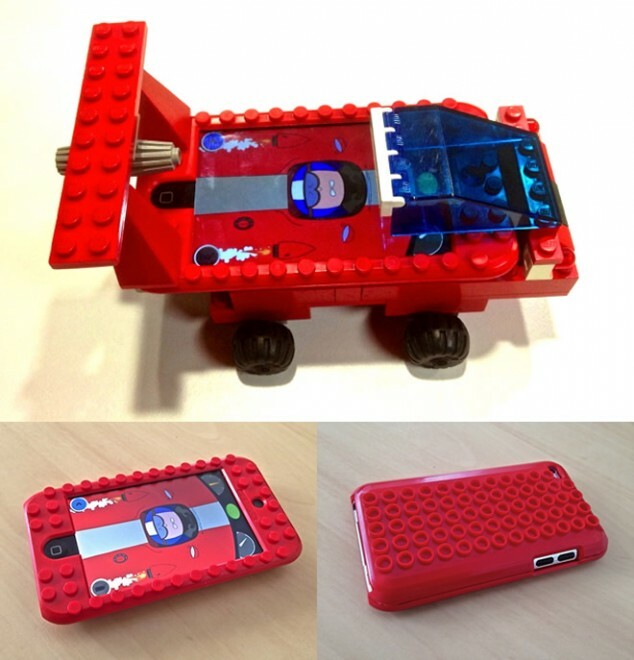 The idea with Makego was that could you use your phone with a Lego case for physical & digital play. Because of the novelty around 'appcessories' at the time, the idea received quite a bit of press (that would never normally touch kids apps): The Creators Project, Gizmodo, Cult of Mac, Wired, The Guardian, Engadget, Ubergizmo, GeekDad, babyology, It's Nice That (just a few in a long list). The app was released in February 2012, the last update was December 2012. Apple has quite rightly started removing abandoned apps from the App Store. For a long time I considered updating Makego, making it universal on tablet, adding it to the kids category, in the hope of some sales. I realised that nothing I did would make it commercially viable, but as a creative experiment I am happy with the results. So with an email from Apple informing me of its removal from the store soon, I decided to post advance warning for anyone that wants to download it. Makego will be removed from the App Store on Monday 9th January at 5pm GMT. December 19, 2016 — Comments are off for this post. 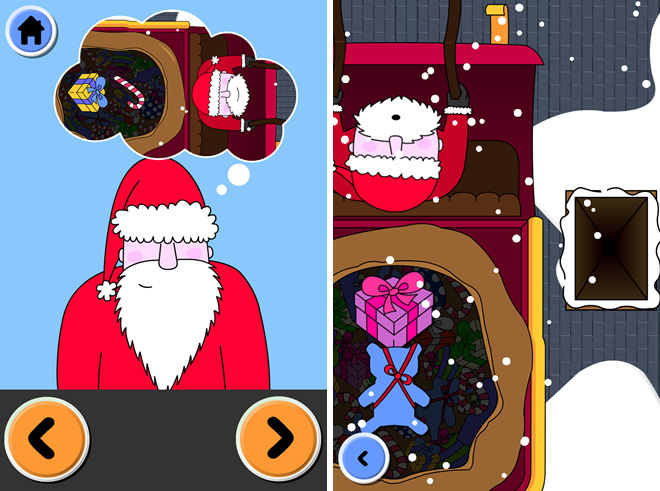 A Christmas update to Monster Mingle is out now on the App Store, Google Play and Amazon. I've been really busy this year making a project for children in Alaska, so this app update is about 3 weeks late. This is just a free last minute update for fans of the game to play this holiday. The update includes some snowy scenery, new body parts and Christmas surprises. As always, any reviews on the App Store are greatly appreciated. October 13, 2016 — Comments are off for this post. 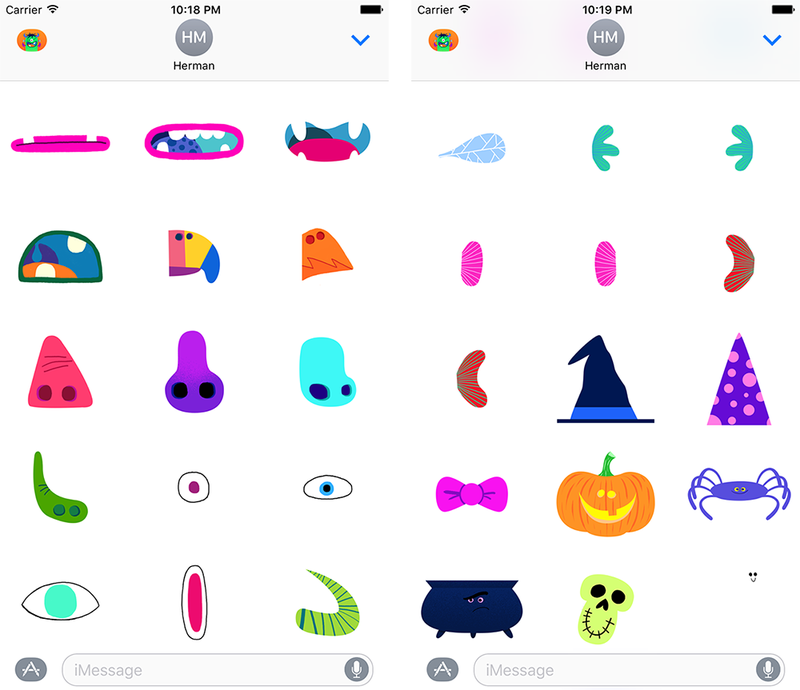 The special halloween content in Monster Mingle is back, along with new iMessage Stickers and a camera snapshot mode. May 23, 2016 — Comments are off for this post. On 14th May, Le Cube (Centre de création numérique) in France ran a Monster Mingle craft making workshop (Les Souriceaux). 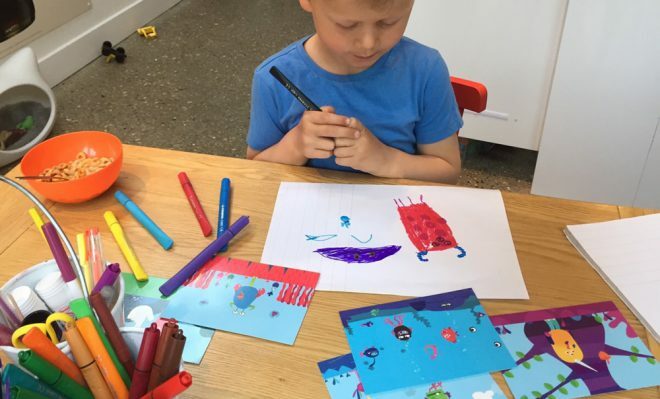 Parents would play the app with their children, discuss what happened to them in the game and went on to create their own monster using craft materials. Some more pictures below. A big thank you to Le Cube and Julie Monne for organising what looks like a lot of fun. May 22, 2016 — Comments are off for this post. 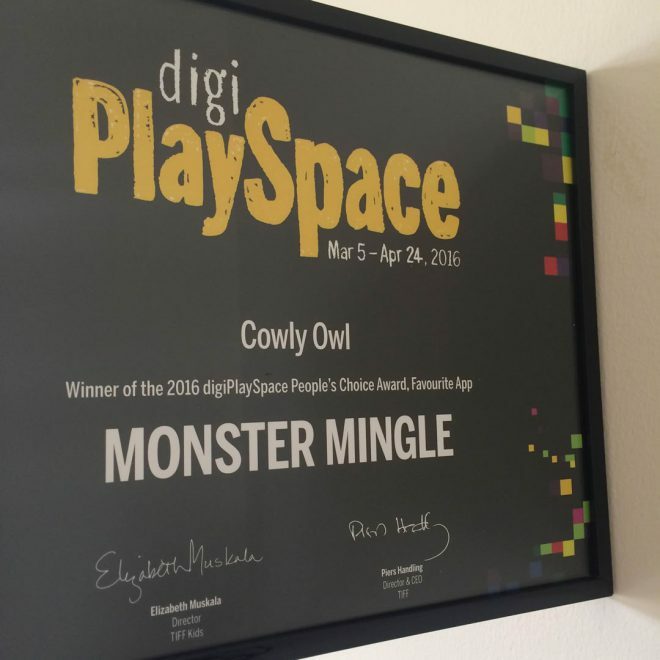 Great news, Monster Mingle has won the People’s Choice Award at TIFF Kids International Film Festival, for best app in the digiPlaySpace. 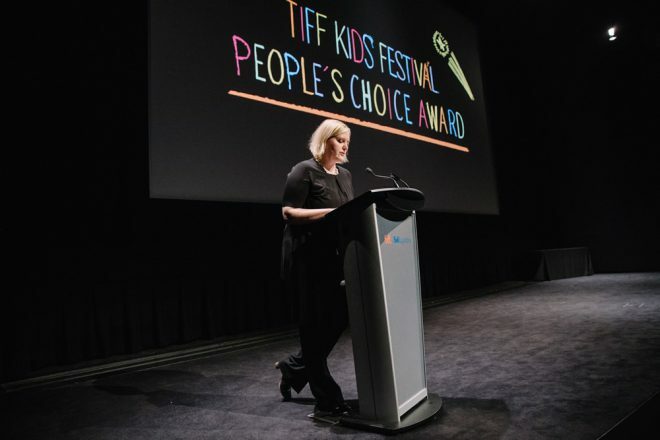 "The TIFF Kids Festival People’s Choice Awards, including two awards for digiPlaySpace, were voted on by festival-goers during the three TIFF Kids Festival public weekends and the entire run of digiPlaySpace"
March 6, 2016 — Comments are off for this post. 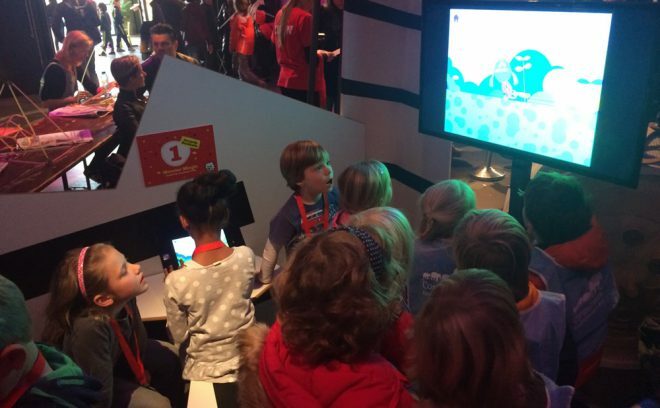 I'm very happy that Monster Mingle has its own special area as part of the digiPlaySpace at TIFF Kids International Film Festival, Toronto. On until 24th April, a show definitely worth seeing if you can, looks great! February 25, 2016 — Comments are off for this post. 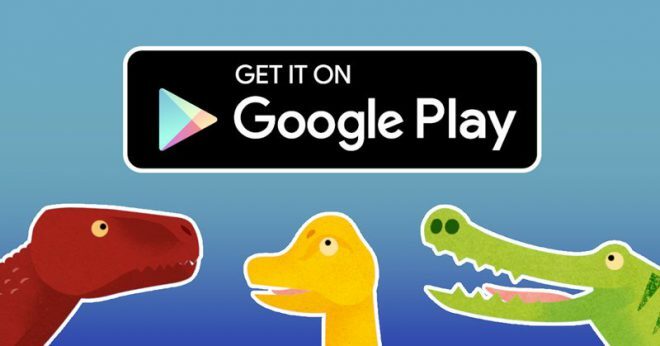 Great news, Dinosaur Mix is now available on Google Play! December 21, 2015 — Comments are off for this post. At the start of the year I attended a Microsoft developer day with the London Unity User Group, doing a test port of Dinosaur Mix to Windows Phone (photos 1 & 2). After 8 months of work, Monster Mingle was released on 23rd April. It was featured in the kids category by Apple (pic) in many countries, but also on the homepage in Japan & South Korea (pic). As a result it temporarily reached the number 1 kids app spot in UK, Japan and South Korea (pic) but it is hard to keep that position. After creating such a long app, I decided to set myself a challenge with an experiment, how quickly could I make and release an app. I created Fireworks Lab, from first sketch to App Store submission in 10 days! It was released on 4th July for Independence Day in the US, got a feature in the kids category and later on went free from 5th November for bonfire night. It was also my first cross platform launch, on iOS and Android from day 1. As an experiment I learnt a lot and what to improve for next time. In September I returned to working part time and looking after my kids. I also started doing freelance work, including something for Primo toys that I'm not allowed to talk about yet. 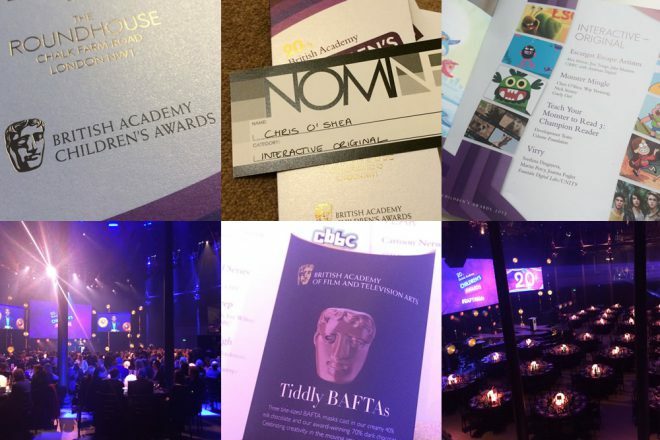 Monster Mingle was also nominated for Children’s BAFTA award, but sadly did not win. Just enough time left to wish you a Merry Christmas and to say a big thank you for all of your support this year! December 17, 2015 — Comments are off for this post. October 29, 2015 — Comments are off for this post. 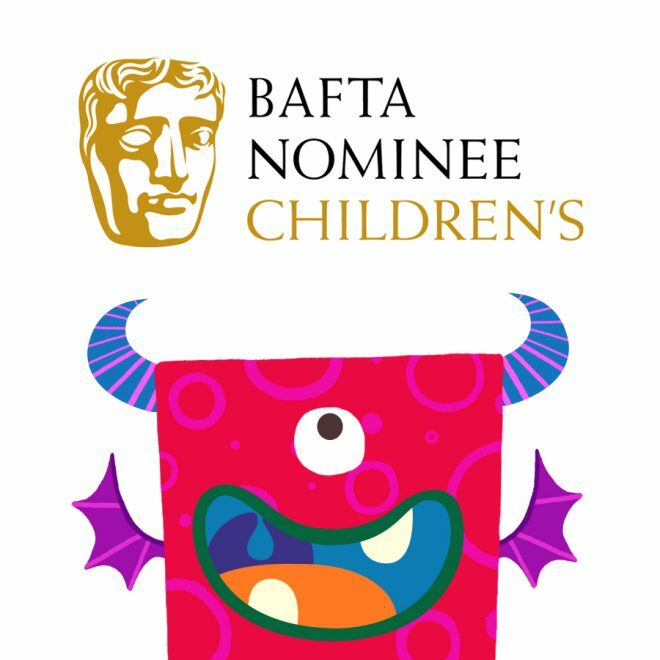 Very happy that Monster Mingle is nominated for Children's BAFTA award. It is up against some very stiff competition in the Interactive Original category, so wish me luck. Update - Unfortunately it didn't win, but it was an honour to be nominated. October 9, 2015 — Comments are off for this post. I'm very happy that Monster Mingle has been nominated for Best New Media Production 2015 at Cinekid. 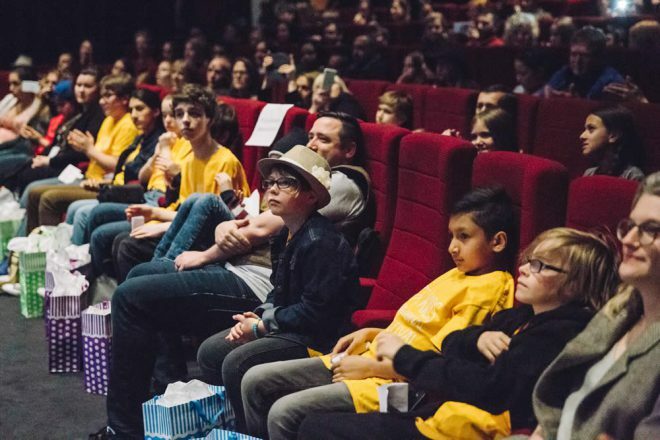 I'm honoured as Cinekid is a fantastic festival for kids and conference. "All nominated productions will be shown during the Cinekid Festival, starting on thursday the 15th of October, in the MediaLab! Out of the 12 nominees the jury will choose one overall winner. 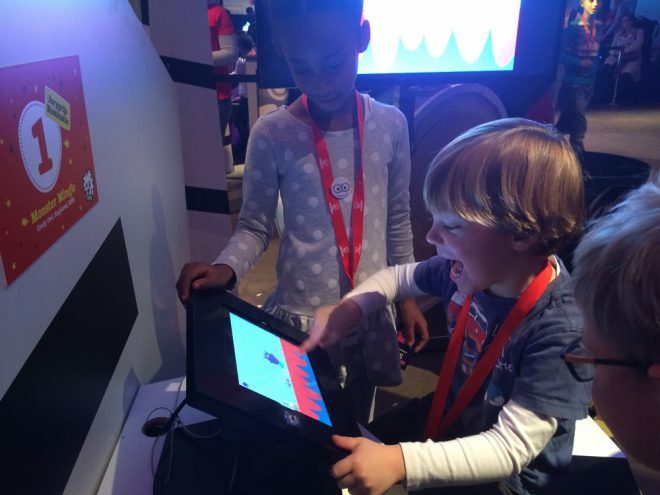 During the entire festival, children can vote for all the projects shown in the MediaLab. The project with the most votes will win the Public Prize. 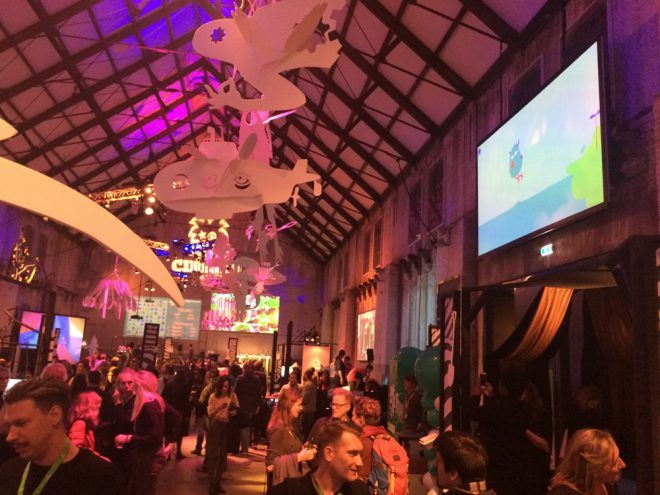 During the award ceremony on the 22nd of October, Cinekid will announce the winners." 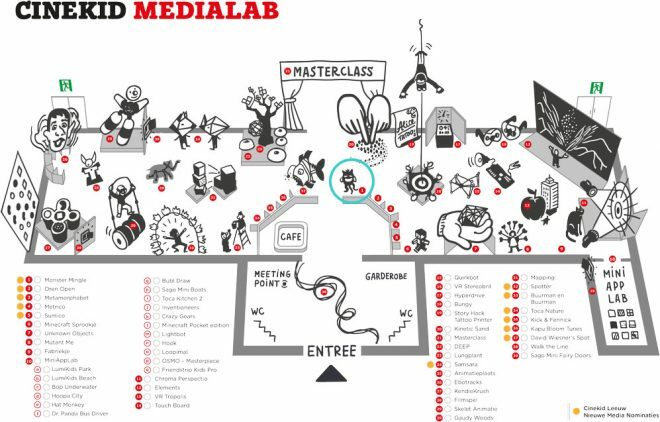 See the MediaLab map above to play with Monster Mingle. See you in Amsterdam! September 3, 2015 — Comments are off for this post. 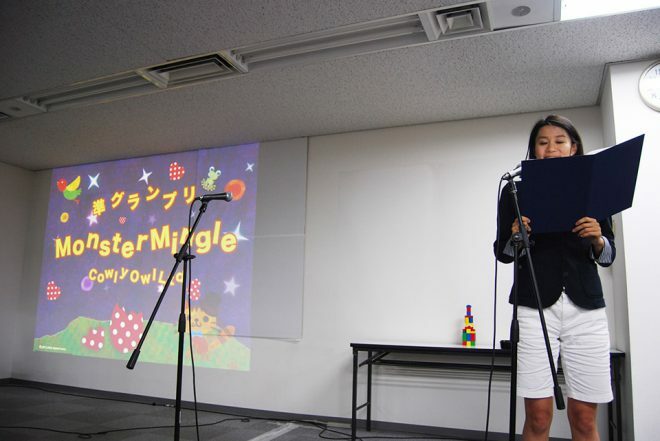 I am very happy that Monster Mingle has won 2nd prize at the Digital Ehon award in Tokyo! (see the winners) It was held as part of the Digital Children's Book Fair last weekend. I couldn't make it to the award ceremony, but some photos are below. I was up against some stiff competition, so very happy with the result. I shared the 2nd prize spot with Sago Mini Road Trip by SagoSago, another very fine app. July 10, 2015 — Comments are off for this post. 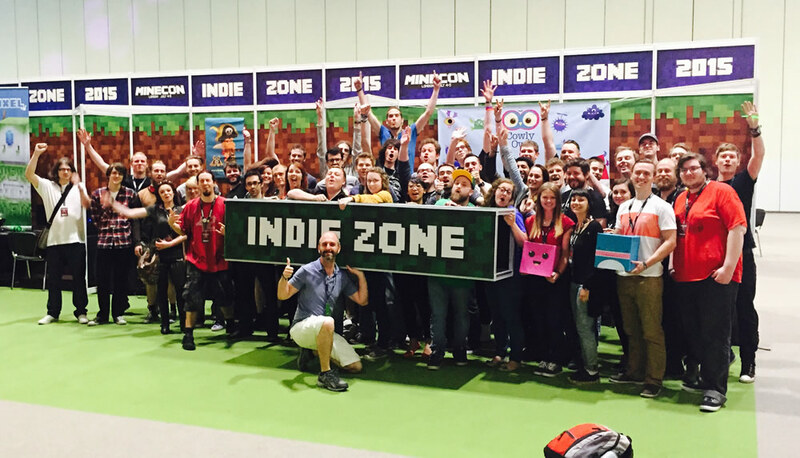 I was lucky enough to be asked to show Monster Mingle in the Indie Zone of Minecon 2015. 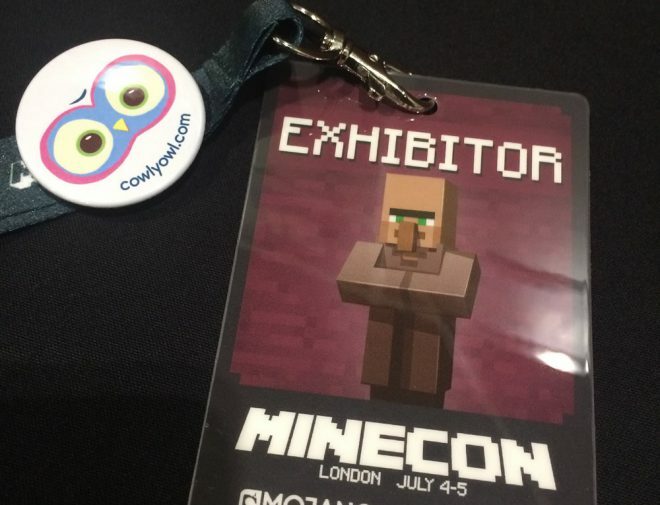 A big thank you to Mojang, John Polson and Multiplay for having me and making the show great. I've not shown my apps in public before, so a week before I had cards, t-shirts, badges and a banner made. They were providing us with PCs to run our games on. Although it is best experienced on a tablet, I decided to make the game run on PC and use it as a test to see how it feels and plays. I was very busy in the run up week before launching Fireworks Lab, so I had set aside 1 day to get Monster Mingle, normally a phone and tablet app, to run on a Windows PC. Because I used Unity, the switch is quite easy, but I had a major problem with some code I was using to generate the water physics (the surface waves and buoyancy). After 8 hours of trying to fix it without success I decided to cut the water physics out, it was better to show the thing working rather than not at all. I'd hidden some of the main menu items, made mouse input work instead of touch and a hand pointer to follow the real hidden mouse pointer. This is what 10,000 people at the opening ceremony of Minecon 2015 looks like! Breaking the Guinness World Record for the largest convention for a single video game. I think tickets sold in 3 minutes. If you are into Minecraft, you should watch the opening ceremony animation of a story around London, nicely done 🙂 There was lots to see and do at Minecon, coverage on BBC and The Guardian. I was a little worried about showing Monster Mingle, as I typically target 3-7 year olds and knew the audience would be a little older. What if they didn't like it, or got bored? Check out photos from the weekend on Flickr. It turns out my worries were completely unfounded. Younger kids loved it, but I had many teenagers playing it for a very long time. Of course some lost interest, but that was the exception rather than the rule. Older children definitely craved the challenge and game mechanics that they are used to. It felt great to get such good feedback, with the younger children in particular coming back again and again over the weekend to play with it. I enjoyed the in depth conversation with the 4 year old girl about all the things she would like to see in it. It also gave me a chance to talk to parents, as my target audience is the children, but you are selling to the parents. Many asked what you had to do in the game, after explaining that it was a creative sandbox for creating your own monster and exploring a world of surprises, there wasn't any comment about goals or high scores. Many parents said they were happy that it was an app without in app purchases or advertising, and especially that there is no violence. For many children growing up between 7-12, the games their friends at school play often aren't suitable for them and some parents said its a relief for them to enjoy something without those pressures. A couple of younger children who had attention disorder type traits, after they sat playing for a long time the parents told me how impressed they were. One thing that I was super happy about is children of all ages taking their headphones off and asking their parents to listen while they played. They wanted them to hear all the musical sounds in the world. For children to appreciate that and want to share this really made my day. July 2, 2015 — Comments are off for this post. I'm happy to announce the release of Fireworks Lab, a new app that encourages children to create and play with fireworks. June 29, 2015 — Comments are off for this post. 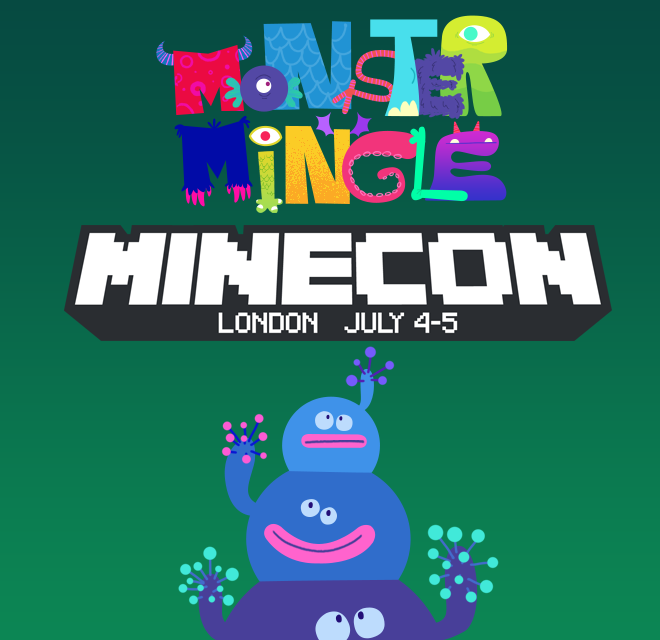 Excited to announce I will be showing Monster Mingle at Minecon this weekend! 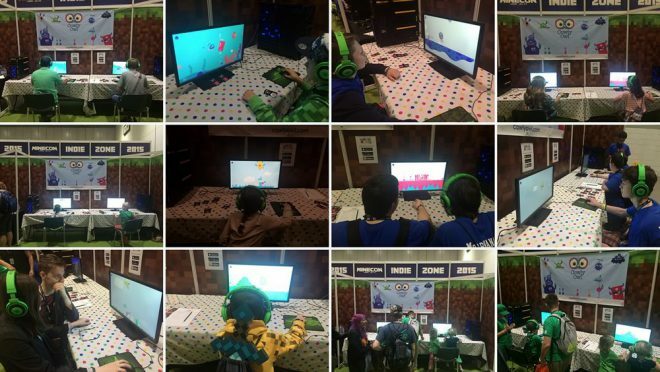 Kids come and play at the Indie Zone. 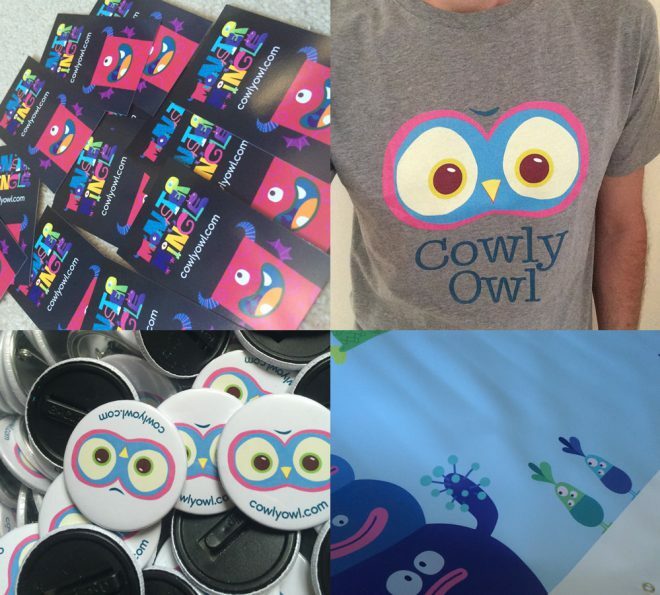 Follow Cowly Owl on Instagram to see behind the scenes. June 11, 2015 — Comments are off for this post. Monster Mingle is now available on Android! Get it on Google play or Amazon. May 5, 2015 — Comments are off for this post. 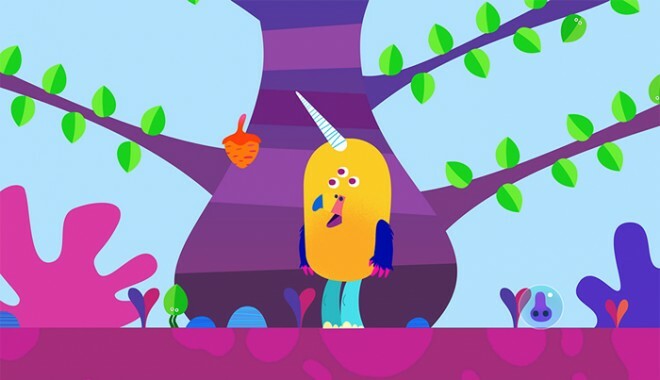 Monster Mingle was released on 23rd of April, created by myself Chris O'Shea (Cowly Owl), working with collaborators Nick Stoney who did character design and illustration, Wip Vernooij creating all animation and Resonate on music and sound design. Monster Mingle follows on from my previous app Dinosaur Mix, where you could create your own dinosaur by finding new body parts inside eggs. I wanted this app to be enjoyed by a wider age range, giving the player control of where the monster goes and providing a world full of surprises. The player starts out with just a body, but then you could hop around and find other parts if you want them. 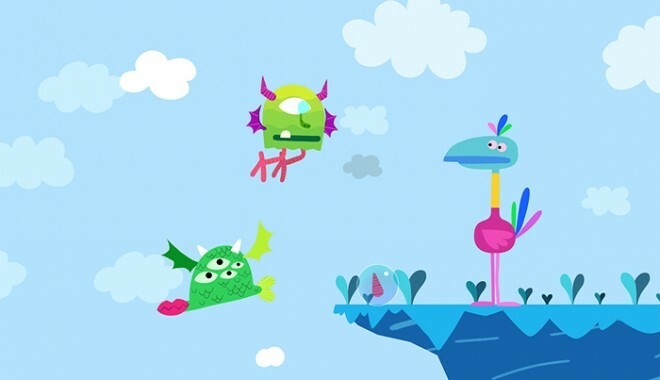 The parts you give your monster would give it new ability, from walking to swimming or flying. I wanted there to be no interface or buttons for building a monster, with everything given to you on a plate. Instead you would find parts hidden around the world and drop them on to your monster. This would lead to a little problem solving, like how do I get off the sea bed, or how do I get up there to find more things to play with. I wanted it to be open ended world with no goals, just explore and swap body parts for the creative fun of it. The idea of the mingle name came about from wanting the player to meet other creatures and be sociable, either through talking or singing together. 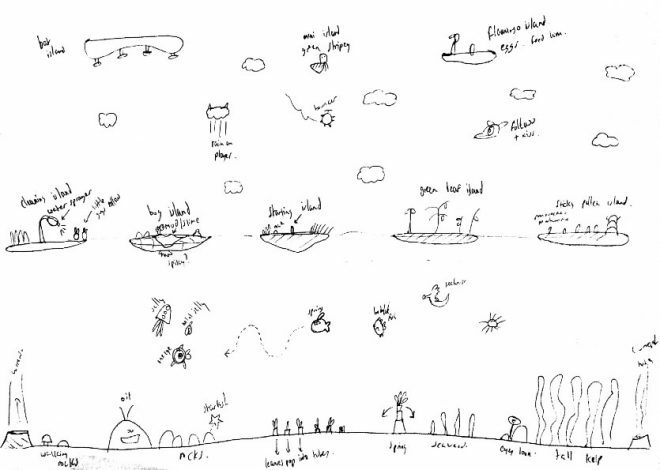 I asked Nick to create a world full of friendly creatures, some of which would interact with you, others might look lost and follow you, or be scared and run away. Nick came back with a wide variety of creatures there were colourful and weird enough to be interesting to kids. 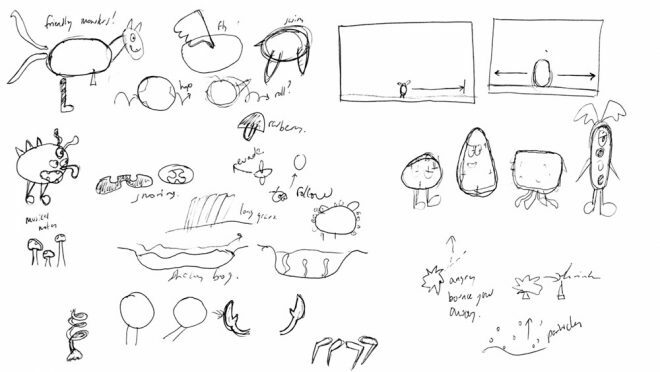 For the main monster we went through various iterations on design of body parts to get them to all work when you fit the parts together. 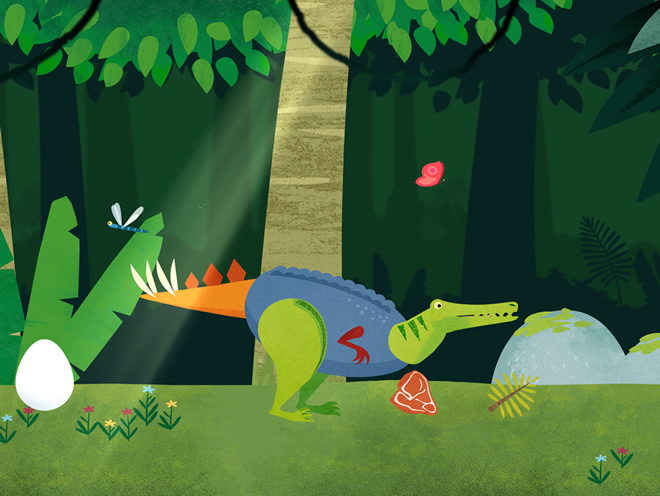 Some creatures would be hidden within the environment, like a rock that gets up and walks away when you are near, a leaf that falls off a tree then runs into the water or creatures hiding beneath the ground. Working with Wip, we decided he should use Anime Studio Pro 10 because the new FBX export feature meant that we could bring the animations into Unity using rigged skinned meshes, rather than sprite based frames. 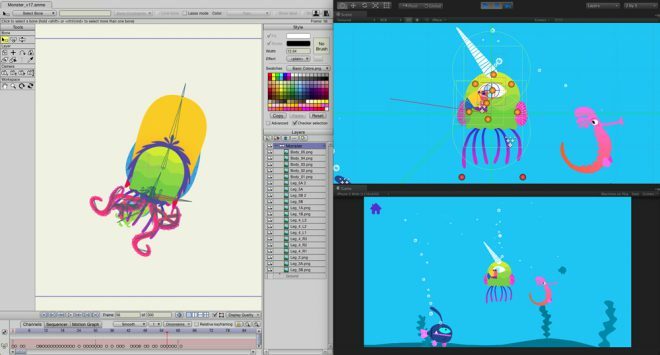 Once the characters were rigged and animated, FBX files were imported into Unity, animations trimmed in the import settings, as well as adding scripts to the animation timeline to control events and sounds. Where possible I used Mesh Baker to convert the multiple meshes per model into 1 mesh and sprite sheet to cut down draw calls. I used a double sided unlit shader on the models so that they could be flipped in the game. 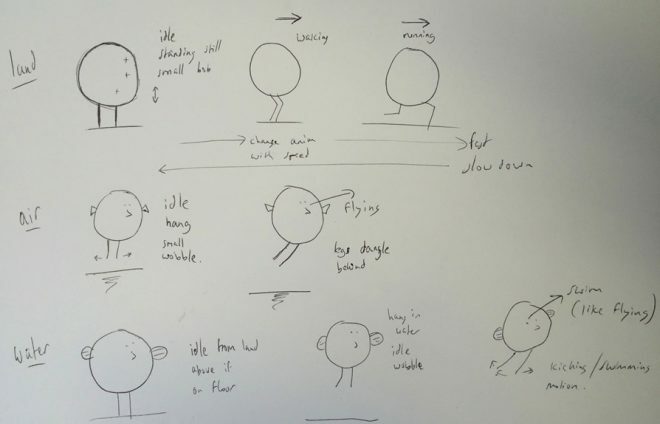 For the main character, the type of legs your monster has effects the movement animation of the body. Wip animated all of the leg walk cycles with all of the bodies attached. In the game you can change legs and bodies, so the character build controller code would switch meshes on and off depending on the part chosen. Custom attachment code would add further parts and animation to the body bones, attaching eyes, mouths, wings and horns. Mecanim was used to create a state machine for controlling all of the animations. Frame based animation was used for all of the mouth animations and eyelids. The app was created in Unity and C#. I used a combination of FBX files for character, 2D Toolkit for sprites and RageSuite to create vector shapes for the islands. With MeshBaker models, they need to always animate so default camera culling wouldn’t work. 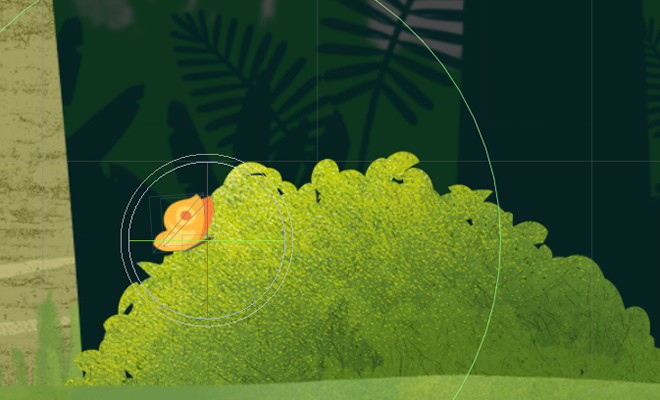 A custom camera culling routine creates a large zone around the camera and turns on animations of any models that are about to come into view. The world was divided up into zones which was used for spawning food and body parts to find. So if you had arms, you’d find some wings near by once you crossed into a new zone, or it would spawn fish fins once you enter the water. One big issue I couldn't overcome was making the world wrap around, so if you go out of the world on the right you would appear on the left. Well that is easy, but the game uses 4 cameras, a mixture of 2D and 3D to create layers of parallax and to make sure the physics lineup. As you approach the edge of the screen, you need to have the camera wrap around to the other side, revealing what you would see on screen. This would mean splitting those cameras up and showing a percentage of each side based on your position, but then I also ran into issues with physics, as an object might be near one edge of the screen overlapping, but not appearing on the other. I tried many routes for a week and couldn't get it right, so had to limit the world to not wrap around in the end. The idea was that you would always start on the same island and explore outwards. There are no wings on the first island, so you can only fall into the water. Once you are in the water you sink to the bottom, you can find fins to swim, but you can also get out by using push up bubble volcanos at either end. Each island had its own colour scheme and different creature you could meet. There had to be enough interesting things to see underwater, on land and in the air. Some creatures come towards you if you are nearby but you are off screen. A lot of time was spent tweaking the size of the level, how apart things are and how long it takes to travel around. Additional coloured islands in the far background were added to help with orientation, to show you which island was nearby. For the sound design, Resonate created all of the monster & creature voices from scratch, which took a lot of tweaking to get the feel right. I wanted no scary growls, but unintelligible gibberish in a musical melodic tone. Everything in the world has a music tone to it, from scenery that you brush past to hidden surprises that you touch. For the theme music I asked for a 1960’s number in the style of the Munsters theme meets April March. It’s a monster mingle, a social gathering. 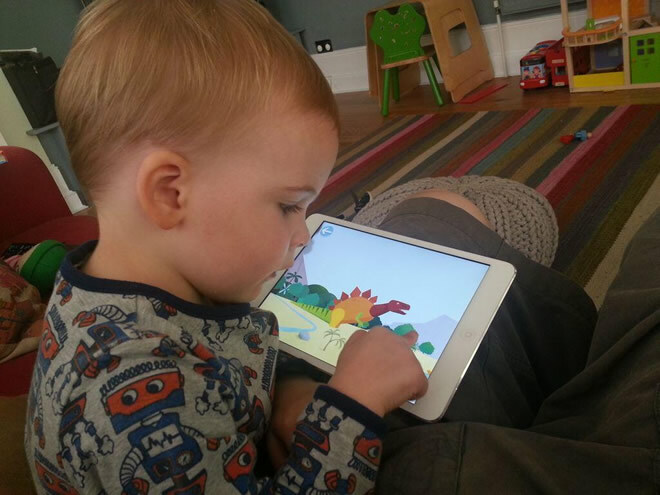 The app was tested from a very early stage with children aged 3-8, with me watching, listening and taking notes. Once something more playable was working, I sent it out to a close network of friends who would test it on their children and film the results. I find this is a great way to get honest feedback, as the child is in their own familiar environment with people that they know. There is no added pressure of someone watching them in case they do something wrong. The result was many videos during development full of issues to fix and think about. It was really lovely to see their reactions, hearing them copy the noises of the monster and laughing at unexpected things. Originally you could swim or fly up, but would bump your head underneath islands. I had worked on a system to give players a push up if they were trying to get on land from the edges but this still didn’t work. I changed it so that you could go up through the bottom of all islands and land on the surface which worked much better. An invisible force also gives you an upwards push when you do so. There was some confusion about how to swim if you have no fins, or how to fly. I added a thought bubble to prompt you with a clue, but I didn’t want to guide them too much, I’d rather children figure things out through experimentation, it’s more rewarding. It’s difficult to get the balance as you don’t want it to be frustrating. A big thank you to the team who helped make Monster Mingle. Keep an eye on this blog or join the fan club list to be notified of future updates. If you like Monster Mingle, please show your support by leaving a review on the App Store. Thanks. April 17, 2015 — Comments are off for this post. Very happy to announce our new app Monster Mingle, out on 23rd of April. August 5, 2014 — Comments are off for this post. 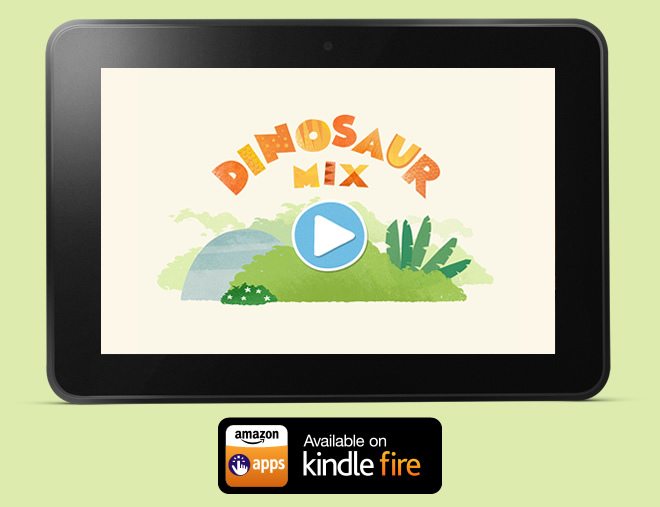 Good news, Dinosaur Mix is now available for Kindle Fire devices. Get it now. July 18, 2014 — Comments are off for this post. 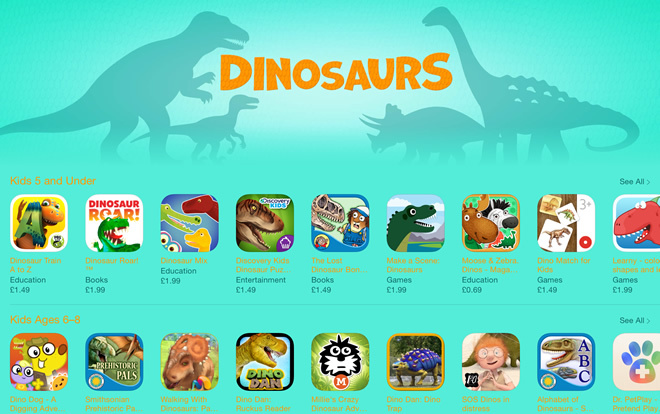 Happy to see the App Store update this week have a collection of dinosaur apps & games for kids, with Dinosaur Mix being included. Thank you Apple. July 11, 2014 — Comments are off for this post. Do please keep sending them in. July 10, 2014 — Comments are off for this post. Just a quick update on Dinosaur Mix, two weeks after launch. The app icon was featured in many places (something like 36 countries). 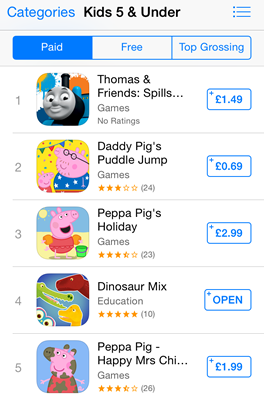 It went reasonably high in the kids chart, but its hard to topple the might of the well known kids brands. There have been 16 reviews of the app, 15 of those were 5 star. With a good average session time of 3-10 minutes (2nd by 10-30 minutes) and an amazing 5% of users playing with the game for over 30 minutes! I am already working on an update that looks at the pacing of the gameplay, adding more variety of interactives in the world to play with. Stay tuned for more. June 26, 2014 — Comments are off for this post. 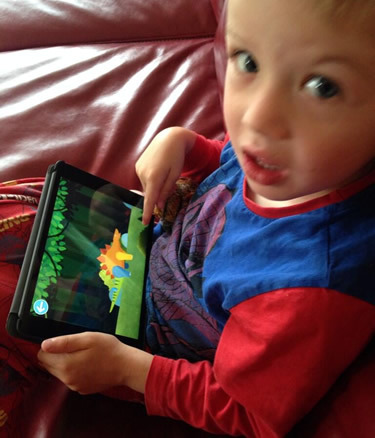 Announcing our newest app Dinosaur Mix, out 26th June for iPhone, iPod Touch and iPad. Create your own dinosaur! Mix and swap body parts then see it come to life. 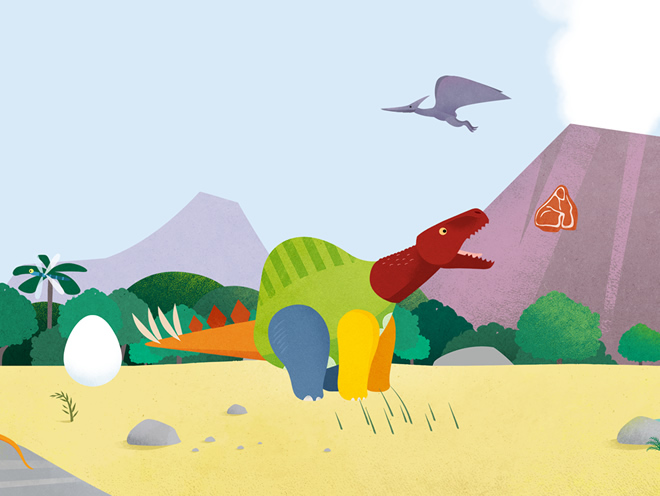 Explore the world, let out a roar and find eggs to change your dinosaur's appearance. Mix up the body, head, tail and legs from a Tyrannosaurus, Spinosaurus, Triceratops, Stegosaurus and Brachiosaurus into many combinations. December 18, 2013 — Comments are off for this post. Just enough time left to wish you all a Merry Christmas and to thank you for all your support this year. 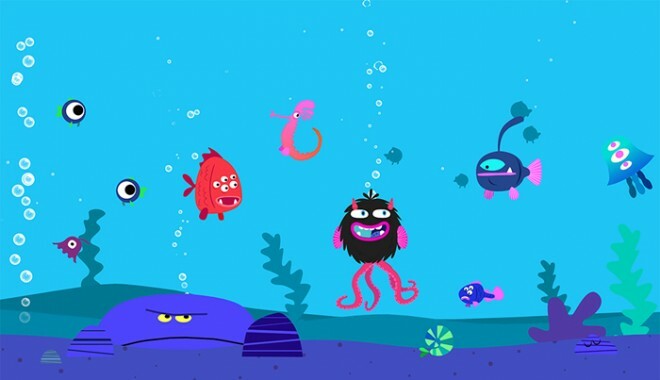 This year Little Digits has received a couple of updates, been featured in the iPad TV ad, and featured as Editors' Choice, 10 Great Kids Apps and the new Kids Category. Along with the apps, I've also been creating interactive installations for children, like Woodland Wiggle for the Royal London Hospital. Have a lovely Christmas and see you in 2014! October 1, 2013 — Comments are off for this post. 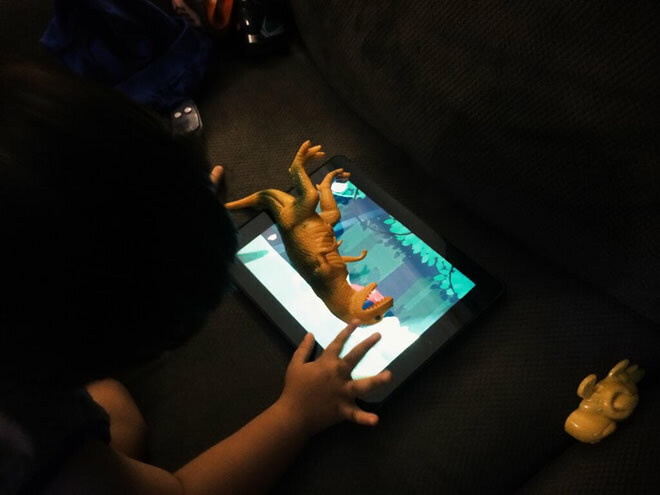 Combining physical and digital for make believe play, our Makego toy app + a Lego case for your device is an ideal combination. However there are a few options out there, so this post aims to help you decide which one is best for you. Released in 2013, Belkin is the officially licensed Lego case. Only available for iPhone 5/5S (update, now available for iPad mini too). BrickCase by SmallWorks is available for iPhone 5/5S, 4/4S and iPod Touch. There are brick mounts on the rear side of the case and on the top edge. 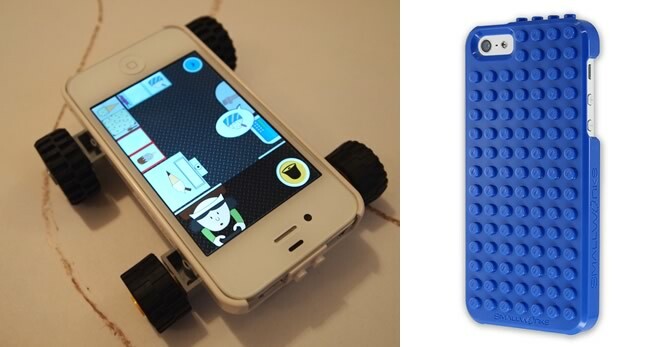 The cases by TinkerBrick are available for iPhone 5/5S, 4/4S and iPod Touch. There are brick mounts on the rear side of the case, none of the side edges but some on the front face of the case. Want some building ideas? Take a look at this Flickr Group. September 18, 2013 — Comments are off for this post. In time for the release of iOS 7 today, Little Digits has been updated with minor bug fixes to make sure it is compatible, so please update to version 1.04 in the App Store. 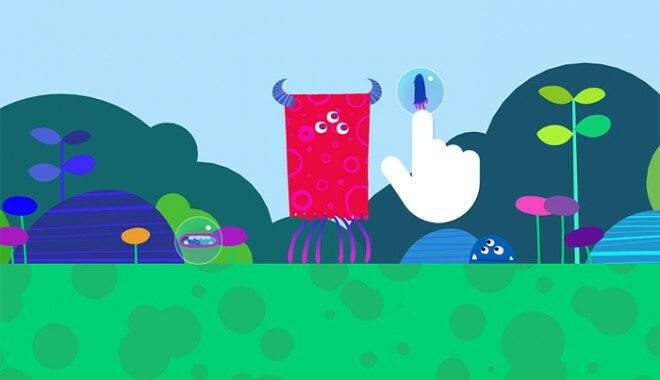 We are happy that Little Digits has been featured by Apple in the new Kids Category, a new featured category on the App Store for apps aimed at children, with tighter rules that help keep kids safe. August 1, 2013 — Comments are off for this post. 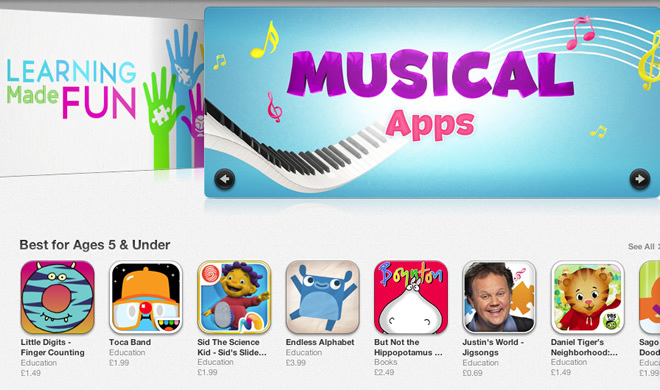 Very happy to see that Little Digits has been included by Apple in the 10 Great Kids Apps feature this week. Last week it was also included in the Entertain your Kids - Apps for the Summer Holidays feature. Thank you Apple! May 7, 2013 — Comments are off for this post. I can see from the sales numbers that Little Digits is being used in schools, quite a few in fact, as they can download the app via the volume purchase program at a discount. On average a school buys 20 copies of the app. 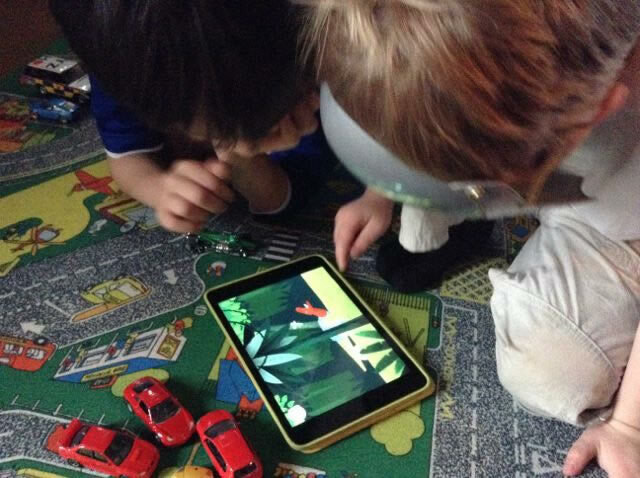 However as a developer you have no idea which schools are using your app, so I was happy when teacher Sacha (@onlinesacha) of new school Montessorischool de Amstel sent me the picture above. If you are an educator and use Little Digits in your classroom, please do get in touch. April 22, 2013 — Comments are off for this post. 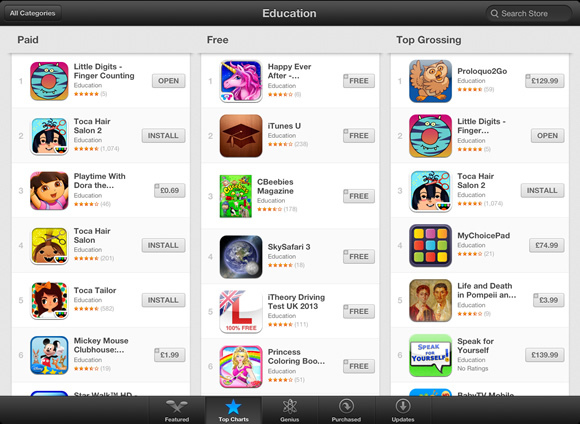 As of writing this post, Little Digits is currently number 1 in the education chart in the UK (shown above). It is top 10 in 17 countries and top 20 in 32 countries (in education). Hurray. April 18, 2013 — Comments are off for this post. I just loaded the App Store like I do every Thursday to see what has been featured, and Little Digits was the first thing I saw. Editors' Choice!! I am jumping for joy, thank you people at Apple. April 17, 2013 — Comments are off for this post. 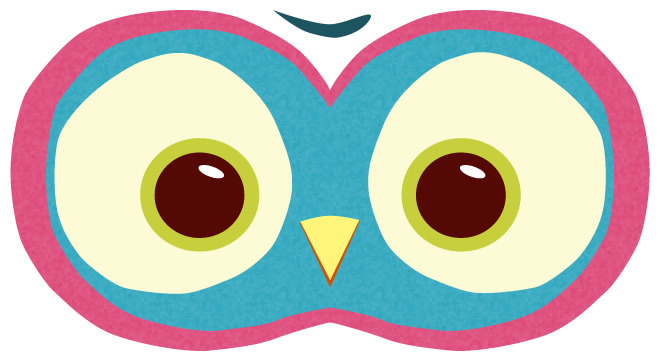 Hello, I am Chris O'Shea, founder and single employee of Cowly Owl. I wanted to write this blog post to let you know the story of how the company came to be and some decisions made along the way. "I use technology to make the unimaginable come to life. Inventing new approaches that explore play, human behaviour and engagement through interaction design and the visual arts. My mission is to create installations, digital toys, play spaces and experiences for everyone, that take us out of the everyday and fill us with joy and wonder. I realised that whilst I really enjoy creating installation work in spaces, I also wanted to put my ideas out to a wider audience in the form of products that you could download at home. 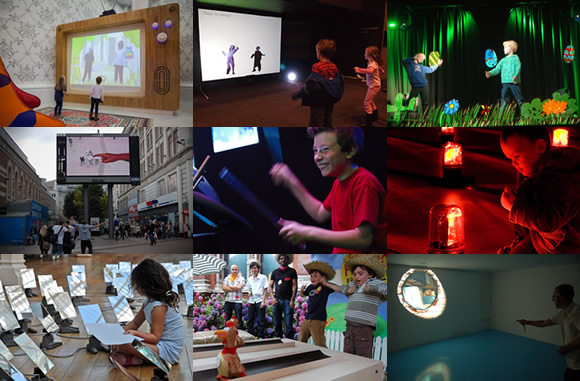 In October 2010 I relaunched my personal portfolio website, with a section for digital toys, saying "Taking the same values and ideas I have for playful experiences, and making them for a distributed audience. Aimed at mobile and home entertainment systems". 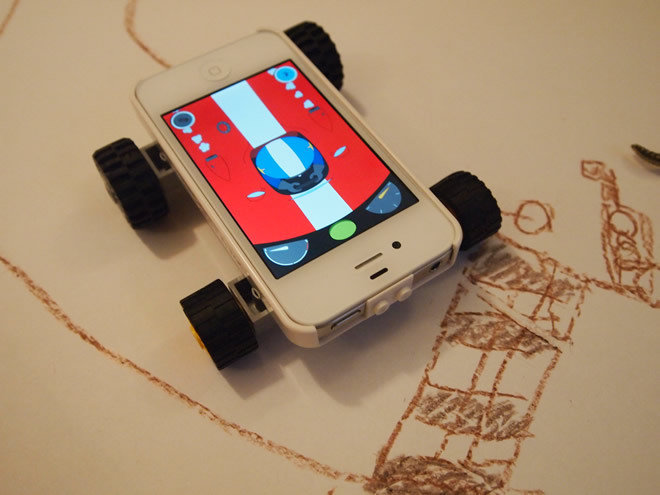 In 2011 after finishing some big screen games for London 2012, I started working on the toy car app Makego. 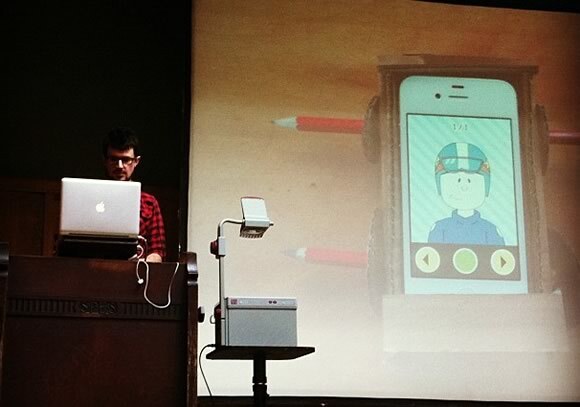 I showed the work for the first time at the Playful conference in October 2011, the app was released in February 2012 (more on that another time). At the end of March 2012, after the launch of Makego, I was at a Smartphone and Tablet Conference organised by TIGA (independent games developers association). On this day I felt motivated that this was what I wanted to do for a living. I decided that to do this long term, I needed to build up a brand that children and parents could remember, rather than publishing apps under my own name. The next day when discussing this with my wife, she came up with the name Cowly Owl. "vachement chouette" is a French saying meaning something is "really cool" or "really nice", a little bit old fashioned, perhaps mostly used by children. Vache also means cow and chouette means owl, so translated vachement chouette is a cow-like owl, in this case Cowly Owl. I announced the startup via Twitter on 13th April and put up a holding page, then started working on Little Digits. I had two main ideas for the logo. The first one to have really simple big eyes and a beak facing you. The second having a cow-like owl, an owl with cow spots and cow tail, sat in a tree facing towards the moon. In the end I decided to go with the former, as it felt friendlier, more approachable. After playing with colours to find those that I thought would fit the brand, I created various iterations of the logo, changing minor details such as eye positioning, beak size, trying to avoid the crazy cross-eyed owl look to find a balance of a young owl but not a baby. The rough edges to the shapes give them a papercraft cut out feeling, as well as the faint paper texture on the pink and blue parts. I wanted to the text to look like it was from a typewriter, giving it an old book feel, and offsetting a more serious tone against the cuter owl. The placement and size of the text used in this way to make up the chest of the owl. I needed an animated ident that would play on promo videos and whenever someone opened an app. My idea was to have an owl that was in hibernation, would be surprised & woken up by your presence and then read the letters as they appeared beneath. I made a really rough version in Flash to use as a starting point. 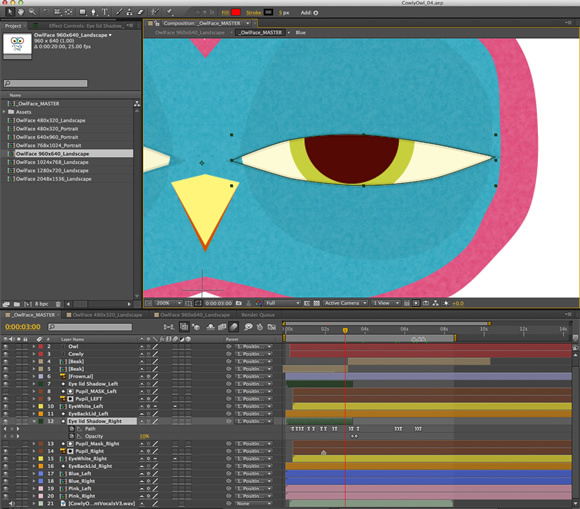 Ben Hanbury, designer and animator created the above animation in After Effects. We went through 5 or so iterations to get to the final version. He had the lovely idea to make the logo shape wobble, making it look like a paper stop motion animation. The music was composed by PitStop Productions who regularly do sound work on games. I asked them to make it happy, magical, a classic Disney feel, rather than some hyperactive kids TV shows that you get today. I wanted it to have an English, classic, countryside, curiosity, story telling feel. A 4 year old girl provided her voice for the ident (and Little Digits). I'm really happy with how it turned out, so a big thank you to Ben and Pitstop. I am now working on the next app, hopefully due out in the summer. To keep up with developments, do join the mailing list above or Like us on Facebook. April 11, 2013 — Comments are off for this post. 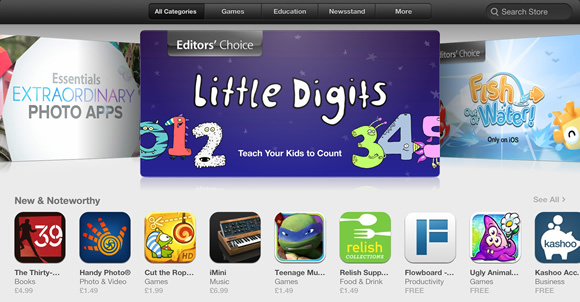 Very happy that Little Digits has been featured by Apple in New & Noteworthy this week, our first front page feature! If you don't already own it, please go buy it and help me climb the charts. April 9, 2013 — Comments are off for this post. 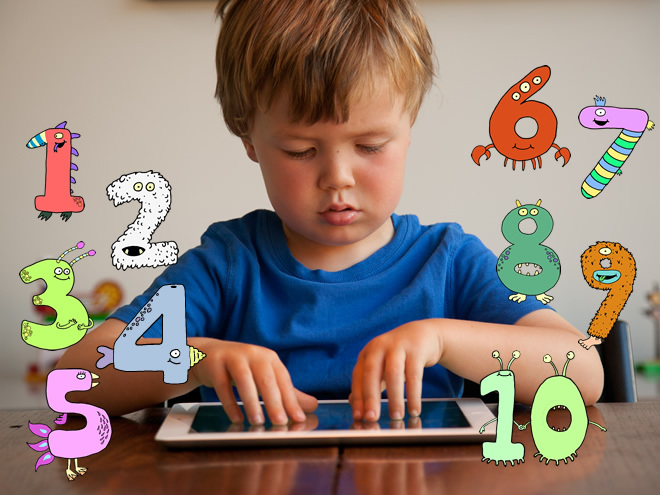 "This app ingeniously prompts kids to experience arithmetic with their fingers -- I can't think of another app which get kids using their brain, and all of their fingers, at the same time. More generally, the app is elegant and RESPECTFUL: one thing that this developer gets right, which seems astonishingly RARE, is that there are no shoddy advertisements, or trapdoor buttons for in-app purchases, that ruin the experience for the little ones. Ultimately it's educational -- it teaches adding and subtracting in a really engaging way!" "Lots of learning opportunities with this App in number sense, basic math skills and number vocabulary through the use of 3 senses, touch, hearing and speech. The recording of your voice saying the numbers is a terrific. 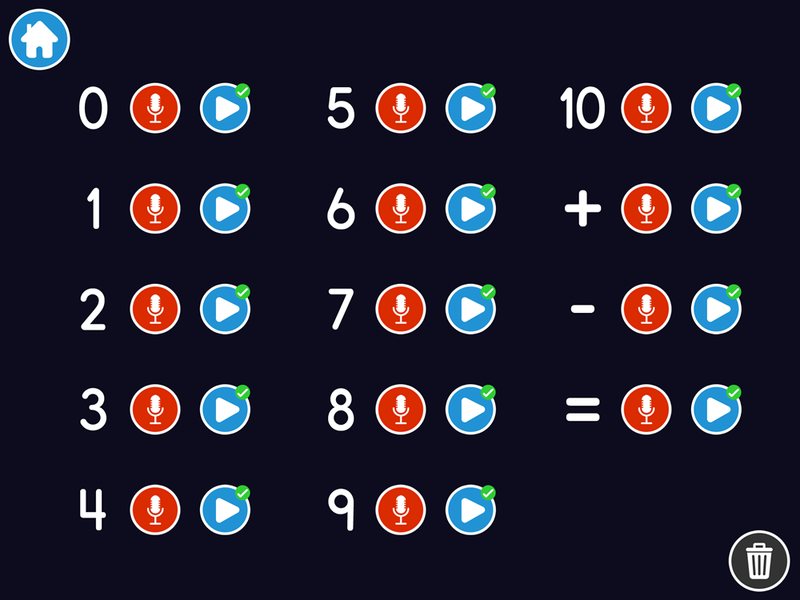 The App will hold the interest of a child through the basics of learning the numbers through learning and review of basic addition and subtraction facts 0-10. This would be a great App for the older developmentally disabled." "If we touch the screen with three fingers, we see three on the screen. It's a simple and engaging technique that works well with kids. I'm confused by the poor reviews for an app that carries creative, quality production. I hope to see more from this developer." "Stops at four. I read all the negative reviews and should've paid attention. Now I am out 2 bucks. This app is so disappointing. Stops after 4. Deleted!" "App crashes after counting to 4. Got this app for my kid after reading rave reviews online. But it crashes all the time. If the developer is reading this, it's only fair I be refunded!" "Only counts to 5 ! Not very good game,should have been FREE, Save your money." "I just loaded this on my iPad mini and it simply doesn't work past three digits. First app that I regret buying." "This does not work. Sometimes it will count up to 5 if I am lucky, but I can never get it to count any further, on my iPad 3." On the iPad, by default multitasking gestures are turned on. This means if you put 4 fingers down and move at all, you either close the app, switch to another or the task bar. As this app uses up to 10 fingers, you need to turn off multitasking gestures. This warning was written as part of the app store description text and on the about screen within the app. This wasn't clear enough, so update 1.03 just released has a popup alert (in 20 languages) at the start and every time you trigger the gesture, to remind you to turn it off. Don't worry this popup is unobtrusive and goes away on its own after a few seconds. Hopefully this will help solve the bad reviews. Sadly you can't reply directly to those people that have posted their anger in a review instead of emailing Cowly Owl for support. Those people that have emailed with questions have always gone away happy that the app works as expected. 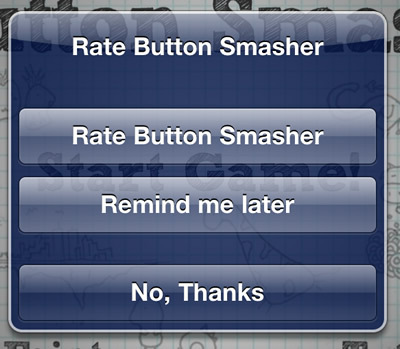 This is the method that most apps use, a popup that asks you to rate the app. This will often come once you've been using the app for a good period of time, or reached a far point in the game, so that you are more likely to write a good review. Not only are these popups annoying, but in apps aimed at children they are very problematic. When a 4 year old is faced with the above, what do they do? Go and ask for help or press a random button, making them leave the app and go back to the app store. Also, you want the parent/carer/teacher to write a review, not a young child, so why bother them with this popup? Many people see an app icon, skim the first part of the description, flick through the screenshots and read the reviews from other people before deciding if they should buy the app. If there are bad reviews saying it doesn't work, they are less likely to buy the app. Cowly Owl is an independent company made up of 1 person, Chris O'Shea. Not backed by a large company, or funded by investors, the last app needs to be profitable to help pay for creating the next app. It's not a goldmine, this industry is hard for the small guys (read "Can independent developers make money from children's apps? "), so I need all the help I can get to improve the income generated from these apps. So if you already own a Cowly Owl app, and would like to see more released, please leave a positive review on the App Store. If you have any questions or problems, please contact me via the support pages. April 5, 2013 — Comments are off for this post. Little Digits has now updated to version 1.03. As an app that uses 10 fingers, you must turn off the multitasking gestures on your iPad, as 4 or more fingers will make the app close, switching you back to the home screen or another app. This is a setting within iOS, beyond a developers control. Although this instruction was within the app description & about screen, it wasn't clear enough. You now see the above message once when the app starts, and every time you trigger the multitasking gesture. This instruction has also been translated into 20 languages, as well as the settings for the app, as shown below. So please update your app and leave a positive review on the app store. March 13, 2013 — Comments are off for this post. 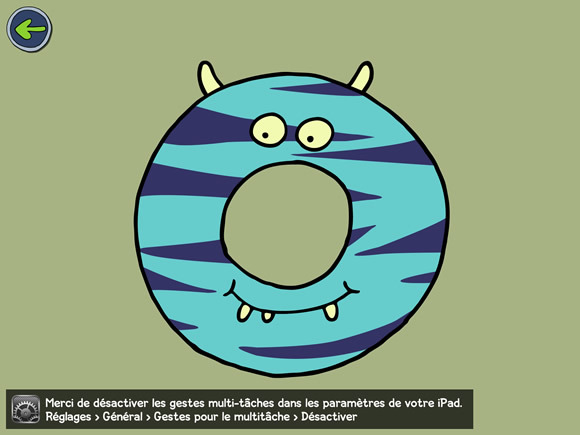 We are very happy that Apple have included Little Digits in the new iPad TV commercial, in France and Germany. Click the links to watch [Edit] The ad is no longer on the Apple site, someone has made a copy on YouTube though. December 17, 2012 — Comments are off for this post. Download it now on the App Store. Merry Christmas everyone! December 14, 2012 — Comments are off for this post. 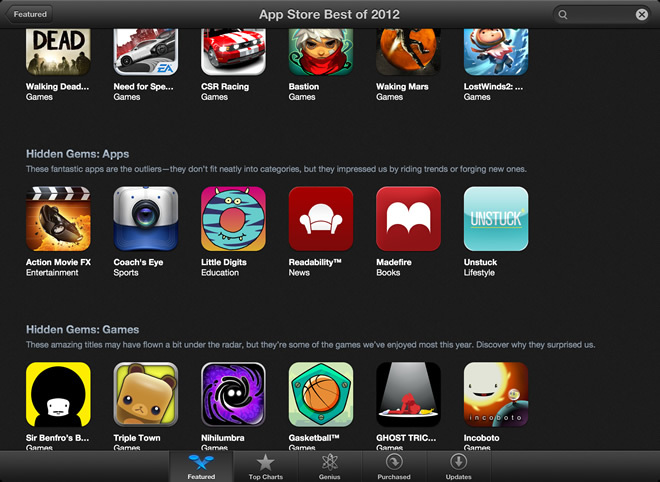 I am very happy indeed that Little Digits has been included in the App Store Best of 2012 feature in the United Kingdom & Ireland. It is listed under Hidden Gems: "These fantastic apps are the outliers - they don't fit neatly into categories, but they impressed us by riding trends or forging new ones". If you haven't already, please do buy the app & help me fund the next set of apps for kids in 2013. December 6, 2012 — Comments are off for this post. 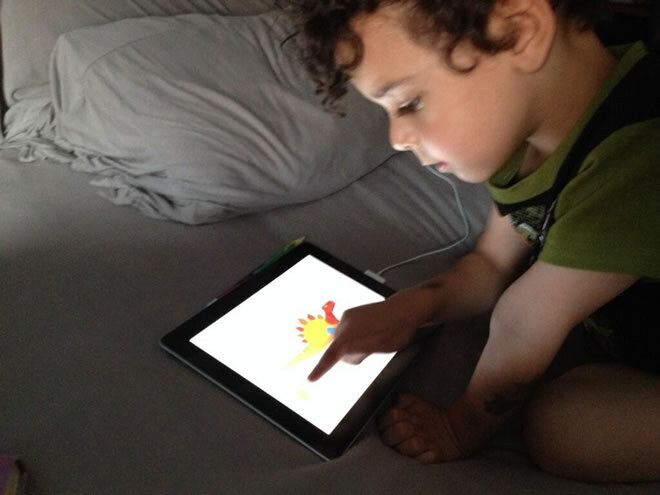 Following on from this post, here are some more videos of people using the Little Digits app. 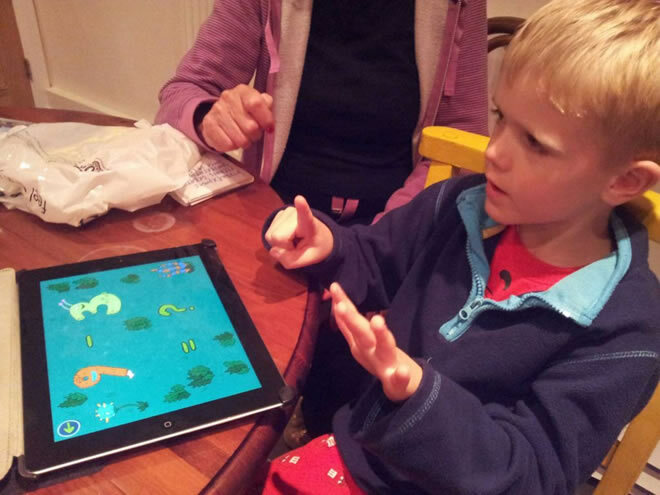 "ZX builds on her fascination with numbers with a cool little iPad app called Little Digits"
Mckade age 9 with autism using little digits app to help with double digit addition. Video demonstration by "Apps for Children With Special Needs"
November 2, 2012 — Comments are off for this post. Happy to confirm that Little Digits works & looks great on the iPad mini. Photo above thanks to @mimeArtistLtd. October 1, 2012 — Comments are off for this post. As a free gift back to our fans, you can now download & print a colouring book for Little Digits right here. 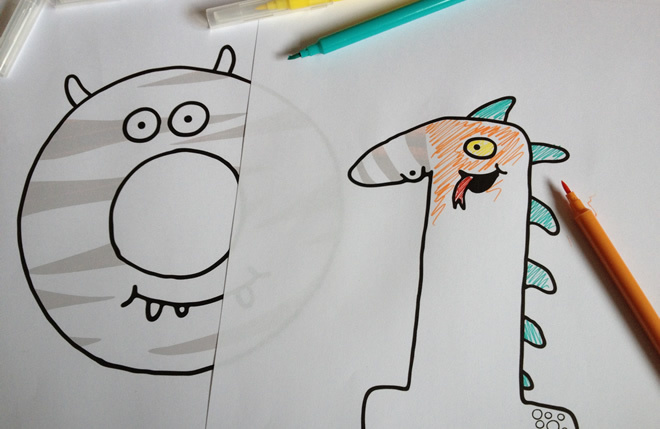 Please feel free to share any photos of your doodles & colouring on our Facebook page. September 16, 2012 — Comments are off for this post. - Background music can now be muted on play screens to help with concentration. 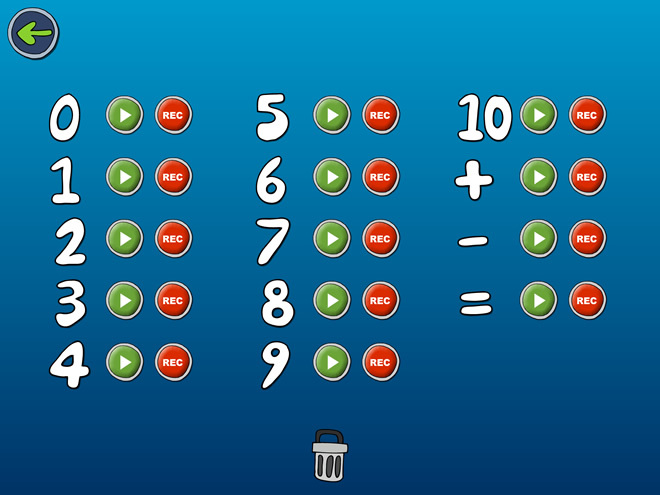 - Difficulty setting, you can now limit the answer for sums to 5 (the default is 1-10). - Record lock, you can now record your own voices, then lock it so no changes can be made. 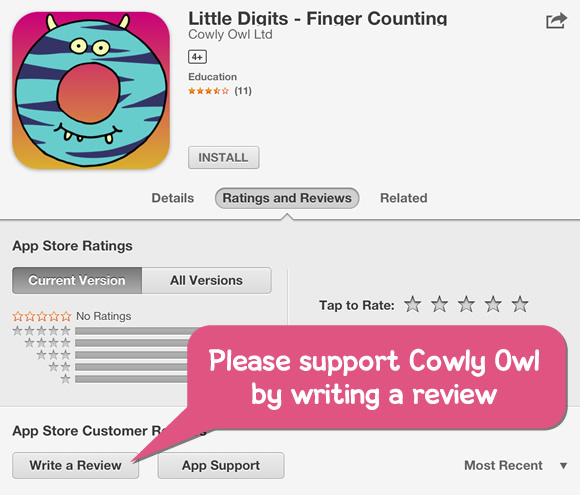 If you like Little Digits, please leave a review on the App Store. Got a problem or suggestion? September 6, 2012 — Comments are off for this post. I had been playing with a prototype they sent to me, but now Tinkerbrick, a Lego brick compatible case for iPod Touch, has been officially released. You can get them on Amazon US. As the Appcessories blog pointed out, it is the perfect accessory to our app Makego. September 1, 2012 — Comments are off for this post. 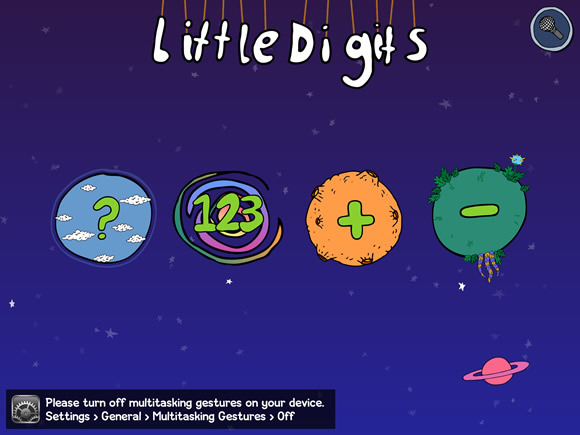 The 1.01 version of Little Digits has gone live. You can now record your own voice samples & in any language you wish. July 19, 2012 — Comments are off for this post. If you have any photos or videos of your children playing with Little Digits & would like to share, please contact me here. July 12, 2012 — Comments are off for this post. I’m very happy to announce the release of our latest app Little Digits. 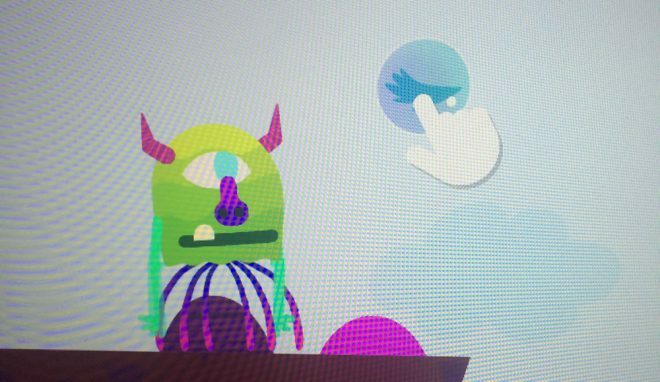 Little Digits is a fun educational app that teaches children about numbers by putting a new spin on finger counting. 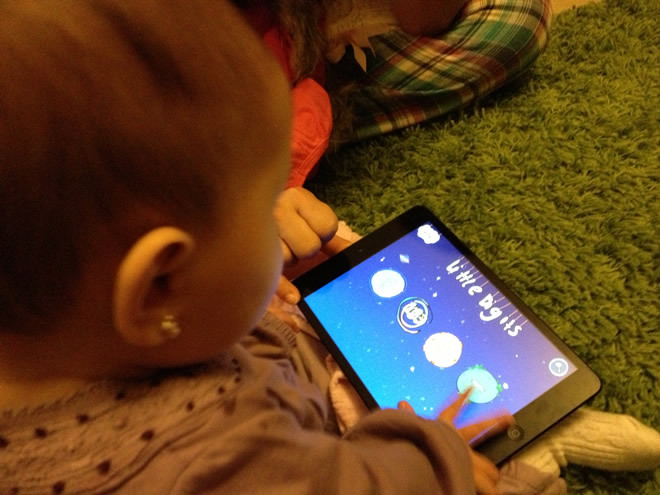 Using the iPad multi-touch screen, Little Digits displays number characters by detecting how many fingers you put down. 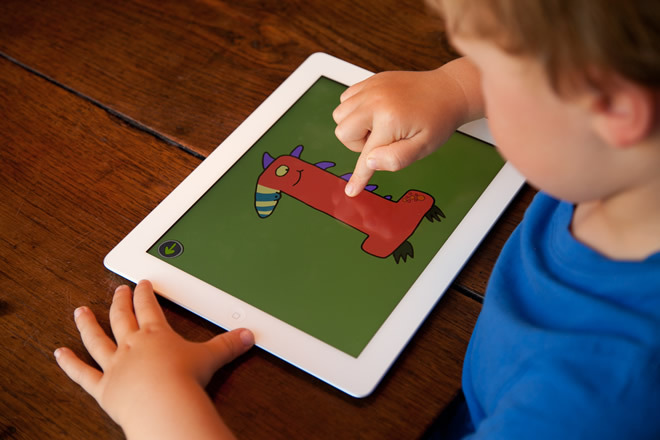 Children can learn to associate the number on the screen with the number of fingers they place down, whilst enjoying the unique characters and animations of the Little Digits world. 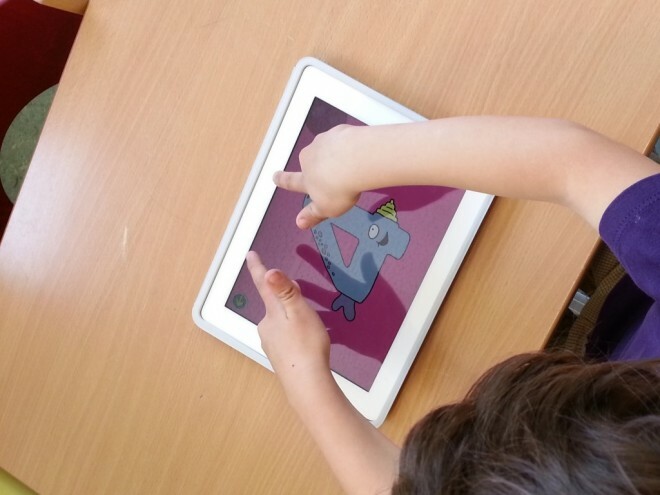 There are also games that introduce small addition and subtraction calculations, where you can work out the answer using the same multi-touch finger detection. 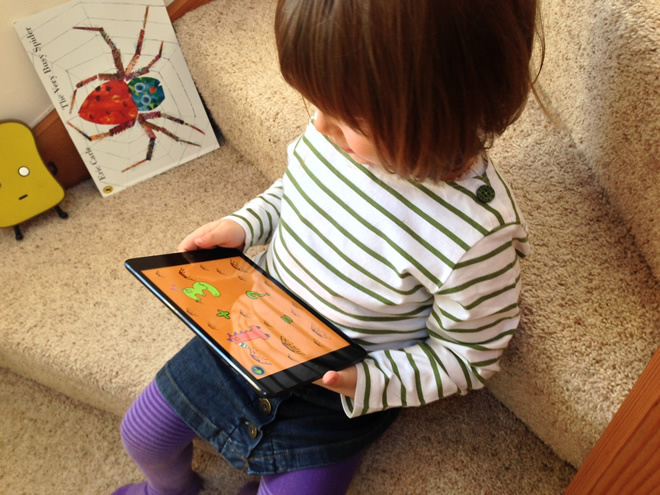 This is an app that will grow with your child’s numerical understanding. Not only can they discover numbers through initial independent play, you can also play collaboratively with your child, each putting fingers down to count and work out calculations together. Then when your child is ready, they can work out the answers for themselves, using their own little digits! April 2, 2012 — Comments are off for this post. I’d like to introduce you to a new startup studio Cowly Owl. Based in London and founded by artist/designer/creative technologist Chris O'Shea. Our first app Makego was published in February by Chris O'Shea, but will soon come under the Cowly Owl brand.